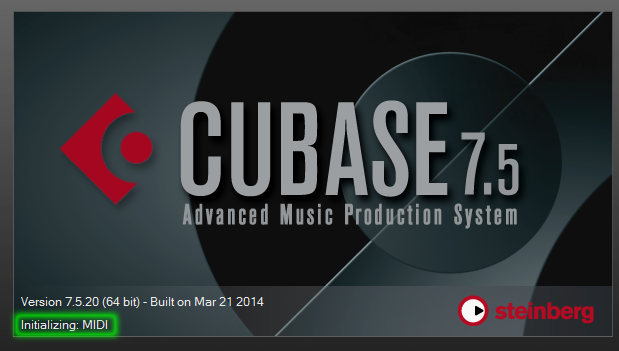 About a year ago I noticed that Cubase was taking an outrageously long time to start up. It seemed like it had gotten gradually worse since I'd originally installed Cubase, and when I watched it, I noticed the vast majority of startup time seemed to be spent at the "Initializing: MIDI" stage. When I first discovered the problem, it was taking about a minute and a half to do whatever Cubase does when it's initializing MIDI. After a bit of searching I ran across this thread at the official Steinberg forums, where numerous other Cubase users were complaining of the same issue. Someone there actually posted a solution which sort of works, but it's not very complete and can actually be pretty dangerous (so please don't follow the steps you see there), but I do credit that poster for identifying the root cause of the problem: Too many extra multimedia device entries in the Windows registry. 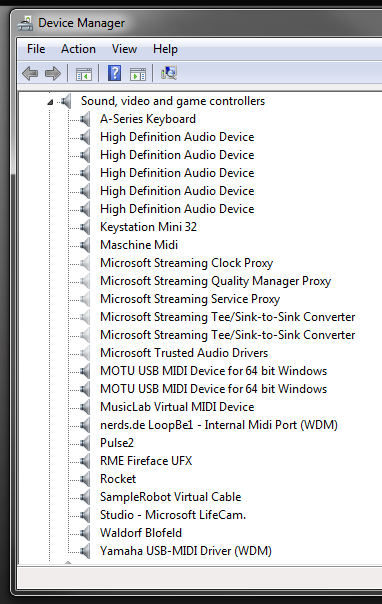 Every time you plug a USB device into a different port on your computer or on a USB hub, Windows creates a new device entry for it. Say you have a USB headset and you plug it into three different ports on your USB hub- Windows will actually create three different device entries as a result, but only one (if any) will be active at any one time. The problem is that Cubase scans your registry for multimedia devices, and every entry it finds increases the startup time a little bit- even if it's for a device you no longer use. Note: The screenshots and specific steps below were done on my 64-bit Windows 7 system, but this should work for all Windows versions from XP up to Windows 8. Close the Device Manager control panel if you currently have it open. Open the System control panel and click Advanced system settings. On the Advanced tab of the System Properties dialog box that appears, click Environment Variables. In the Environment Variables dialog that appears, click the New... button in the System variables section of the dialog. 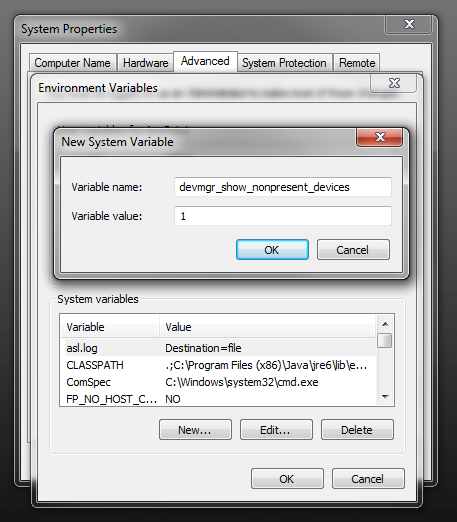 In the Edit System Variable dialog, enter devmgr_show_nonpresent_devices for Variable name and put 1 for Variable value. Click OK > OK > OK and then close the System control panel. 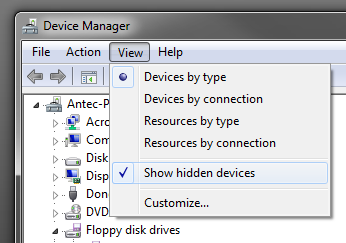 Now open the Device Manager control panel, and enable View > Show hidden devices. 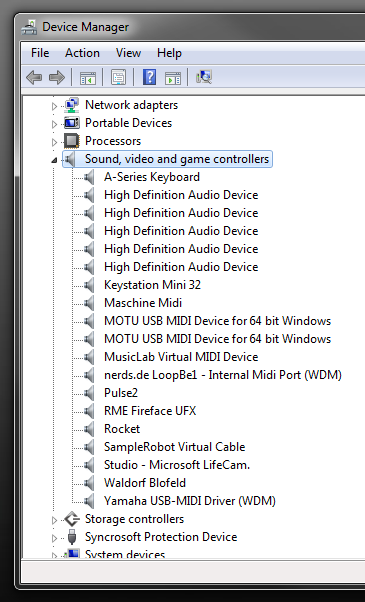 Now expand the Sound, video and game controllers section of the Device Manager. You will probably see a number of new entries now. The little speaker icons next to the "hidden" entries will appear grayed out compared to those for the active devices. Here's what I saw after performing the above steps. Notice the huge difference- all those grayed-out hidden devices! My computer still had entries from pieces of gear that I don't even own anymore! Please note that some of these hidden entries are important operating system components that you should not remove. Basically leave any of the Microsoft stuff alone. 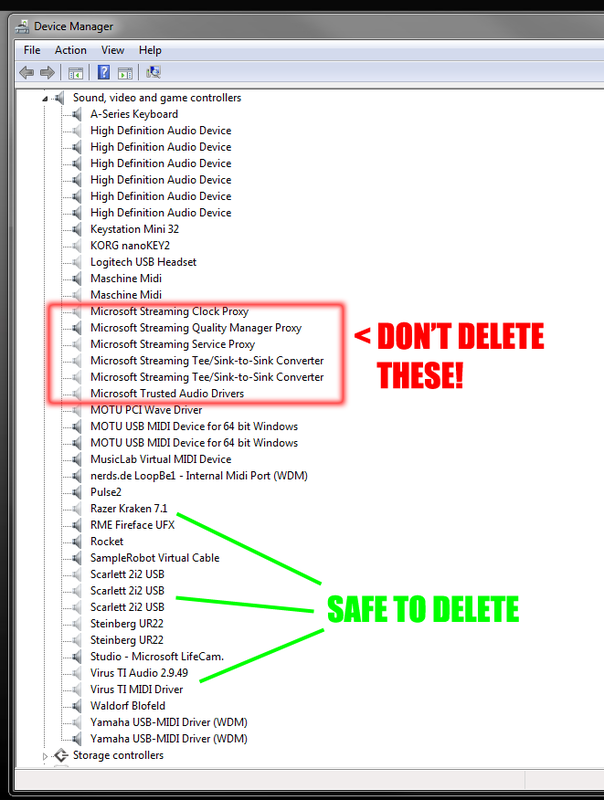 Only perform the following steps on devices that you recognize and know that it will be safe for you to remove. 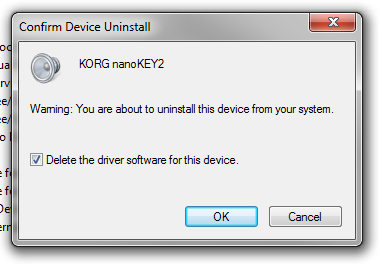 Right-click a device entry that you wish to remove, and then click Uninstall. If the device's drivers were not provided with the Windows operating system, Device Manager will ask if you want to delete the device driver along with the device entry. Only check this box if you do not plan to use this device anymore on your computer. (Otherwise you will have to reinstall the drivers if you ever connect the device again.) Since I was removing entries for devices I'd actually sold, I would delete any duplicates first without checking the "delete the driver software" box, but I would check the box when removing the final instance. (For example, I deleted the first two Scarlett 2i2 entries without checking the box, but then checked the box when I deleted the third and final entry. After repeating the above steps for each unwanted device entry, close the Device Manager and then launch Cubase and see if things start up any quicker. Before trimming out the extra devices, the "Initialize: MIDI" stage of Cubase startup was taking 24 seconds on my PC. Now it takes only 16 seconds (a 33% reduction). If you have fewer multimedia devices plugged in than I do, you'll probably see even faster speeds. I woke up this morning to a new Firefox (version 29, the official debut of Mozilla's new "Australis" theme) that I was quite unhappy with. For one thing, the Menu Bar was gone (with the File, Edit, View menus, etc. ), and for another, the "star" button for adding bookmarks was just instantly shoving all my bookmarks into the "Unsorted Bookmarks" folder without giving me a chance to pick the proper folder or set tags. I'm running Windows 7 64-bit and my currently installed Mozilla Firefox is 29.0.1. Here's how I restored the Menu Bar and figured out how to add bookmarks properly. Press ALT on your keyboard. The Menu Bar will momentarily appear at the top of your Firefox window. It will automatically go away if you select any commands until you "anchor" it with the next step. If you accidentally do something to make it go away, just press ALT again. With the Menu Bar showing, go to View > Toolbars > Menu Bar. If you find that you don't like having the Menu Bar, you can hide it again by going to View > Toolbars > Menu Bar again. If you're showing the Menu Bar, you can go to Bookmarks > Bookmark This Page. This will pop open a dialog by the star button where you can enter tags and select the proper folder to store the bookmark. If you don't wish to use the Menu Bar, you can just press CTRL+D to open the bookmark dialog. The little clipboard looking icon next to the star opens your Bookmarks list. To get to the searchable bookmark organizer view, you can either go to Bookmarks > Show All Bookmarks or click the clipboard button and scroll all the way to the bottom of the list, where you can click Show All Bookmarks. Also, if you've added any new bookmarks since Firefox updated to version 29 and you're wondering where they went, take a look in the Unsorted Bookmarks folder. If you find yourself using the Blue Star method, one sort of useful thing about it is that once a bookmark is stored (when the star appears blue), if you click the star again, it will bring up a dialog where you can tag and move the bookmark. So, instead of using CTRL+D to add a new bookmark, you could just click the star twice. It's kind of a strange implmentation (basically, you create an untagged, unsorted bookmark, and then tag and sort it), but it works well enough. Also, I'm not much of an addons user, but lots of folks who were similarly annoyed with Firefox 29 have installed the Classic Theme Restorer and seem pretty happy with it. I've been complaining about Battery 4 ever since I first loaded it up and realized that several features I'd always relied on in Battery 3 were nowhere to be found. Native Instruments gave Battery 4 a beautiful user interface and a nice, modern set of kits- but the cutting of not one, not two- but several of Battery 3's most important and distinguishing features makes so little sense that I almost felt betrayed. I'm thankful that as a Komplete 6 and 8 owner I have access to Battery 3, and that it still works fine on modern DAWs and operating systems. But every time I hear someone ask, "Hey, what's wrong with Battery 4?" I end up reciting the same list of omitted features. I finally sat down and put together a video that demonstrates some of the most significant differences, and hopefully illustrates why Battery 3 is by far the better tool for people who like to make their own kits and customize their sounds. Here's an official Battery 3 trailer, I presume from 2006 when B3 was first introduced. It even lists a feature or two that I didn't mention in my video. Native Instruments- you tarnished your own classic!